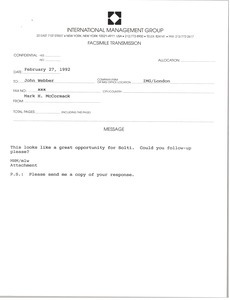 McCormack sends a letter he wrote to Kenji Aoki of N. H. K. Symphony Orchestra regarding bringing Sir Georg Solti to the N. H. K. for the 70th anniversary concerts. 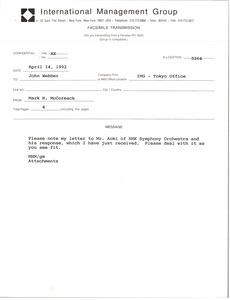 Aoki's response is also included. McCormack sends a letter from Kenji Aoki of the N. H. K. Symphony Orchestra regarding Maestro Sir Georg Solti conducting for the Symphony's 70th anniversary.